May Blossom: A Comfy Place! A beautiful new addition to my beloved collection of vintage chairs, was beautifully placed under our tree on Christmas morning. An old Captain's Chair. 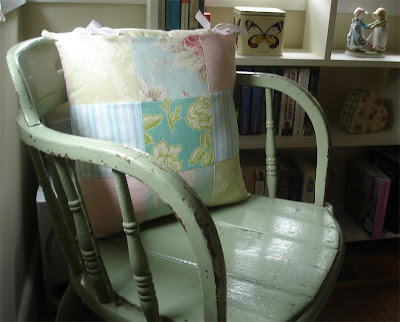 It is sitting in my kitchen, I decided to make a little cushion to make it all the more inviting. Lily said it looks like the cushion has pigtails!! Amazing how some of the simplest things can be so very beautiful. Love the chair, and I have a bunch of charm squares I think I need to cut this way and that way, all to make some fancy smancy design. Thanks for the inspiration. I see a simple quilt in my future. I love the chair. Especially the green paint. Lucky you. Also love your pincushions! That is a lovely old chair Simone. I remember them being in the offices I worked in many years ago. The boss always sat in those...guess you are the boss of the house now!